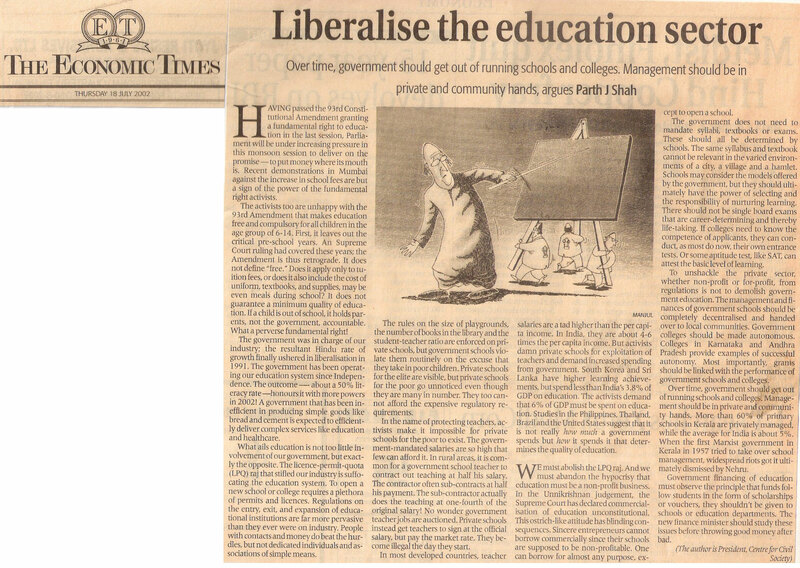 Having passed the 93rd Constitutional Amendment granting a Fundamental Right to Education in the last session, the Parliament will be under increasing pressure in this monsoon session to deliver on the promise—to put money where its mouth has been. Recent demonstrations in Mumbai against the increase in school fees are but a sign of the power of the fundamental-right activists. After a conference in Bali, Parth J Shah is convinced that economic freedom, not old-fashioned theories of sustainable development, is the key to prosperity and growth. As my colleague and I walking down towards immigration at the airport in Bali, we saw f a large banner which read, "Welcome Delegates." Before we could absorb the pleasant surprise of being welcomed by the government of Indonesia, we spotted the rest of the message, which clarified that the welcome was for delegates to a meeting for the World Summit on Sustainable Development. After all is said and done, nothing much has improved in Gujarat. In Parliament, opposition parties howled, staged walk-outs, even got a resolution passed in one of the Houses, though largely of symbolic value. Symbolism is what we got from the main instrument of democracy. Politicians took tours of the affected areas, visited relief camps, walked in peace marches, a few went on a relay fast. Yes, relay-fast, an invention of the symbolic times. Liberalism is distinguished by its focus on the primacy of the individual in all spheres of human life—political, economic, and social. Individual well being is the standard to assess suitability of norms, customs, policies, and institutions. As Adam Smith’s invisible hand or Friedrich Hayek’s spontaneous order theory demonstrates there is no conflict between pursuit of self-interest and social good. Liberalism helps identify the rules necessary to achieve the harmony between self-interest and social good: limited government, rule of law, private property, free competition, and voluntary interactions. Securities and Exchange Board of India (SEBI) is again set to tighten the law against insider trading. The law was first passed in 1992 and amended very recently in February 2002. As the amendment is more than ten times longer than the original law, one would have thought that SEBI must have plugged all the loop holes. But one would be wrong; a lot more work is apparently required to banish insider trading from the Indian securities market. I am writing this column on Dhanteras, the beginning of the five-day festival of Deepavali. (Dhan: wealth and Teras: the thirteenth day of the month of Ashwin). It’s the day when Lakshmi, the goddess of wealth is worshiped. Dhan is celebrated by purchasing new clothes, utensils, and ornaments, and in villages by decorating cattle, the main form of wealth. Deepak Suri’s cycle rickshaw got impounded by the police. After years of living off petty thefts, he felt enough was enough. He decided to earn an honest living; he bought a used cycle rickshaw. For 1200 rupees. The police asked for Rs 400 to release it. Distraught, Suri borrowed twenty rupees and bought a bottle of kerosene. The tenth anniversary of India’s liberalisation program came and went. Mostly unacknowledged and uncelebrated, like that of an unwanted child, a child forced upon by the unpleasant circumstance that one rather not remember. It’s not just unwanted but also illegitimate. The father prime minister has disowned it. Even after ten years of birth, its intellectual, political, as well as bureaucratic parentage is in debate. The Cabinet has approved the competition bill despite crucial differences among the members of the Committee on Competition Policy. The importance of these disagreements could be judged by the rather unusual inclusion of two Supplementary Notes, a Note of Dissent, and a Comment on Dissent in the Committee’s report. This is no typical committee report! The competition law claims to protect consumers against monopolistic, collusive, predatory, restrictive, and unfair business practices.